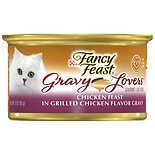 Shop Fancy Feast Gravy Lovers Gourmet Cat Food (3 oz. )3 oz. 5 for 4 dollars and 00 cents or 1 for 0 dollars and 99 cents 5/$4.00 or 1/$0.99$0.33 / oz. 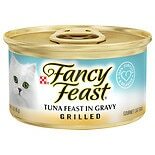 Shop Fancy Feast Grilled Gourmet Cat Food Tuna Feast in Gravy (3 oz. )3 oz. 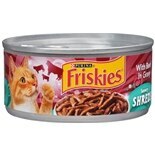 Shop Friskies Savory Shreds Cat Food Beef in Gravy (5.5 oz. )5.5 oz. 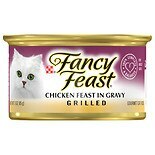 Shop Fancy Feast Grilled Gourmet Cat Food Chicken in Gravy (3 oz. )3 oz. 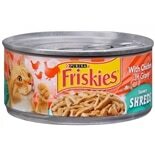 Shop Friskies Savory Shreds Cat Food Chicken in Gravy (5.5 oz. )5.5 oz. 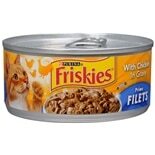 Shop Friskies Prime Filets Cat Food Chicken in Gravy (5.5 oz. )5.5 oz. 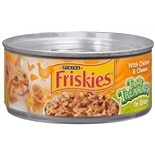 Shop Friskies Tasty Treasures Cat Food Chicken & Cheese in Gravy (5.5 oz. )5.5 oz.